R Franklin James grew up in the San Francisco Bay Area. Her love of writing was nourished at the early age of eight when she and her best friend would write wandering tales of pirates and damsels in distress. A graduate of the University of California at Berkele, she cultivated a different type of writing—legislation and political policy. After a career of public policy and advocacy she focused on her first love, writing, and in 2013 her debut novel, The Fallen Angels Book Club, was published by Camel Press, Seattle, WA. This is the first book in the Hollis Morgan mystery series, her second book, Sticks & Stones, was released on May 1st . James is married with two sons and resides in northern California. 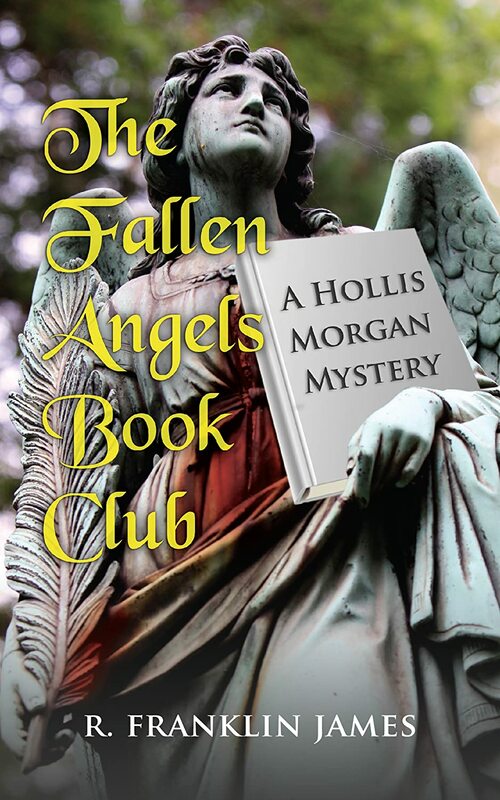 My inspiration for writing the Hollis Morgan character and The Fallen Angel’s Book Club originated with an online writing class. My fellow class members came from all over the world, from a variety of backgrounds and an assortment of personalities—including one psychopath. Only we didn’t know until members started receiving e-mail threats after giving critiques. Our instructor dropped him (or her) from the list, but I couldn’t shake the idea of a group of people seemingly coming together to share in writing only to be stalked or hounded by a thin-skinned writer. I gave my group a secret—their criminal past, and the Fallen Angels were born. This is a six book series, and book two: Sticks & Stones, was released in May. My inspiration in general centers on people stories coupled with a wicked imagination. Generally, I’m an outliner, I like knowing where I’m going…at least to get started. Usually by page 30 I’ve moved away from my outline and the story takes over. I’ll write to about midway in the book, and then I think about “who did it”. At that point I’ll write the last two chapters so I know who the villain is, and then I go back to the middle and write straight to the end. Using this method I have never had writer’s block. If I’m fumbling around, I go back to my outline to see what ideas I had in to start. I used to think that characters talking to authors was looney–until it happened to me. Even though I outline, my main characters often create situations and scenes that I’m not aware of when I sit down in my chair. Usually it’s their dialog that puts me onto another track. I had what I thought was going to be a minor character in book two, who took over and became a compelling figure and is still around in book four! Never, ever, never, ever give up. If you love the craft of writing and the art of putting words together to form a story that entertains and enriches, then you must write. Treat writing like you would any career that you love, embrace it and give it your best. I go back to never ever give up. It took me almost eight years to find an agent, and then it happened through networking. I believed in my writing, that it was only a matter of time before I would find someone who saw what I did. Once I got my agent, she was able to place my book within months. Actually I had two publishers making offers at the same time. The irony was not lost on me. Old traditions die hard, even as the industry swears it’s aware that the market has changed. Writers and their royalties are still treated as if this is the 20th century. Self publishing is putting more and more pressure on the big 6 publishers to change their business model. It’s not there yet, but I think by 2020 a corner will be turned.